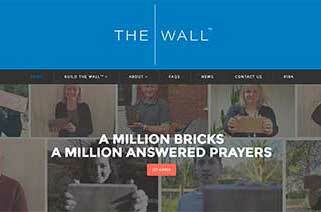 After a successful Kickstarter campaign of £47,215 earlier this summer, plans to see a National Prayer Landmark, called The Wall of Answered Prayer, continue to take shape. The first of two panels to whittle down entries from the recent Global Design competition takes place in London today (14 November). Since September, the team behind the project has been inviting people from across the world to submit their concept designs for the Landmark. Following a partnership with the Royal Institute of British Architects, 150 expressions of interest have been received, with 133 actual submissions. Entries have been received from 24 countries worldwide, including Russia, Iran, Vietnam, Hong Kong, Australia, USA and many from within the European Union. Before the end of November, the 132 entries will be whittled down to a shortlist of four designs. Judging the concept designs include Baroness Sal Brinton, President of the Liberal Democrats, the Rt Hon Stephen Timms MP, Labour Faith Envoy and Chair of the All Party Parliamentary Group for Faith and Society, Pam Rhodes, Writer and Broadcaster and Anna Pepperall, Gateshead Art Curator and Rev Gavin Calver, Director of Mission for Evangelical Alliance. The shortlist will be announced at a Parliamentary Reception, hosted by the Rt Hon Stephen Timms MP in February. When the iconic Prayer Landmark will be built of a million bricks, which will symbolise a million answered prayers. “I’m actually blown away by the depth and breadth of the response to this Global Design Competition. The Wall of Answered Prayer project is encouraging those who have prayed to Jesus and believe their prayer was answered to share their story on www.thewall.org.uk and donate funds to help finance this unique piece of public art. For each brick bought in The Wall a brick will also be donated for social housing both in the UK and abroad. Any excess funds from the project will be donated to charity. It is expected that ‘The Wall’ will bring significant economic benefit to the locality where it is built. The Angel of the North estimate that the installation in Gateshead has generated more than £500m to the area to date. A shortlist of potential sites is currently being drafted with the preferred site hoped to be announced in the summer of 2017.